The 2-disc release Corea, Clarke & White - Forever is pure rock-jazz pleasure featuring pianist Chick Corea, bassist Stanley Clarke, and drummer Lenny White, along with special guests Jean-Luc Ponty, Bill Connors, and Chaka Khan. This is about as good as it gets! Corea, Clarke & White - Forever was produced by Lenny White, and co-produced by Chick Corea and Stanley Clarke on the Concord Jazz record label, a division of Concord Music Group. The release Forever was recorded live during the trio's world tour in 2009, and is their follow-up to the critically acclaimed 2008 United States reunion tour of Corea, Clarke, & White [Return to Forever]. Individually, they have redefined the genre of improvisational rock-jazz, as a trio they are a tour-de-force on Forever, which is a 2-disc set of songs from their own songbooks, jams from their 2009 world tour, and covers of classics from Thelonious Monk, Bill Evans, and Miles Davis. Corea, Clarke & White - Forever released in June 2011, is the perfect commemoration as Chick Corea celebrates his 70th birthday on June 12, 2011, and Stanley celebrates his 60th birthday on June 30, 2011. The release [Disc 1] opens with the song On Green Dolphin Street, a jazz-classic from the 1947 movie Green Dolphin Street. Chick Corea sparkles on the keyboards as he makes the music come alive on this animated track. The second track is Waltz for Debby (Bill Evans) that opens with a piano solo by Chick Corea and leads the trio into a lively swing beat. Selecting from Corea's songbook the trio lights into the track Bud Powell with a driving beat, and from Stanley Clarke they cover the track La Conción de Sofia, a poignant song that shows the mastery of Stanley's bow on the upright bass as he ebbs and flows between the feelings of wonder, enlightenment, and optimism. Disc 1 also includes the 3 tracks from Chick Corea, Windows, an animated melody driven by Chick's piano work and taken home by the tight bass line, No Mystery, the title track from one of Return to Forever's most memorable releases (1975), a fast paced track that sets off each instrument against their own instrumental emotional interlude, and Seňor Mouse, a track with flare and sass, and knitted together by the improvisation mastery of the trio. Rounding out Disc 1 is the trio's playful cover of the Thelonious Monk track Hackensack. Disc 2 takes the trio off the road and into the studio with contributions from Bill Connors, Jean-Luc Ponty, and Chaka Khan. The disc opens with just the trio performing Corea's Captain Marvel, a fusion of a little bit of this and a little bit of that as the trio bounces off each other with just the right balance of instrumental give and take. Complementing their Disc 1 live version of Seňor Mouse, they invited Bill Connors to reprise the original sound with a guitar contribution. The cover of John Coltrane's Crescent is a piano and drum duo, and their rendition is as refreshing and energetic as "Trane's." Armando's Rhumba (Corea) features the fiery violin work of Jean-Luc Ponty with Corea and Clarke sealing the delivery with passionate harmonies and timely solos. The track Renaissance (Ponty) is an improvisational fusion of the masters at work triggered by Ponty's violin and Corea's piano. Disc 2 also includes the cover of Gershwin's I Loves you Porgy, featuring Chaka Khan on vocals, Clarke's After the Cosmic Rain, featuring Jean-Luc Ponty and Bill Connors, and three tracks from Chick Corea, High Wire - The Aerialist, Space Circus, and 500 Miles High. 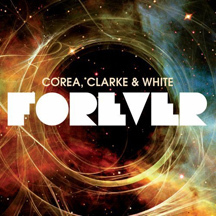 Corea, Clarke & White - Forever is a smashing two disc rock-jazz release that features a sample from the road, and a sample from the studio, the perfect fusion of style, music, and friends. Websites where you can procure Corea, Clarke & White - Forever are Amazon, Vintage Vinyl, Audiophile Imports, iTunes, and The Music Shop. © June 2011. Luxury Experience. www.LuxuryExperience.com. All rights reserved.